I am a big fan of Christmas so other than my favourite authors turning up on Christmas day to play silly games and eat my Christmas dinner surely the next best thing is when one of your favourite authors release a Christmassy book! 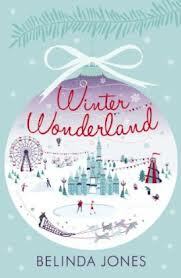 I was so delighted when Winter Wonderland by Belinda Jones arrived on my doorstep as this is one writer who get s me in the holiday spirit with her writing so surely she can get me in the festive mood too! Imagine waking up in a snow globe... That's how travel journalist Krista feels when she arrives in magical Quebec to report on Canada's glittering Winter Carnival. Over ten sub-zero days Krista's formerly frozen heart begins to melt as she discovers an enchanting world of ice palaces, husky dog-sledding and maple-syrup treats galore. And then she meets Jacques, a man as handsome and rugged as he is mysterious... The two share a secret that could bond them forever, but can they find a way to break through the protective layers around their hearts to warm up this winter wonderland? ...let the snow-spangled adventure begin. Wow..... Although we don’t have the festive roast cooking or Santa popping down the chimney this book still brings the perfect backdrop, I am talking the cold chill with our friend snow, cute fluffy dogs pulling sledges..... oh I am in my element! How does this author manage to wrap you up in the setting so much so that you feel like you have been to the location! Belinda Jones is back in full swing this year, she needs to be on commission because her beautiful and informative writing skill has sparked an interest in me to visit Quebec, now that is saying something for me because I only do Summer holidays! The author also manages to give you a tour of Quebec and gives you a number of facts and many must see sights but all of this is weaved perfectly into a great storyline. I loved each and every character in this book, there were more than our fair share of tasty men to choose from. Our Heroine Krista took a little time to warm to but as the story progressed her character softened and became an enjoyable character to read and towards the end of the book when you find out her secret she becomes even more loveable. The ending was rather predictable to me but this didn't ruin it for me it was great to watch what you had a feeling was going to happen unfold. I am a hopeless romantic so this book was perfection for me with the gentle romance blossoming in this picturesque scene. I am sure this book will be a hit this Christmas my one and only negative about this book is that I wasn't invited along to help with the research that Belinda clearly undertook for this book! Thanks for the giveaway Rea. I'd like to win this book because it sounds a lovely festive read to get in the mood for Christmas. I would like to thank you so much for such a fantastic book giveaway, that i would love to have the oportunity of reading. It is wonderful to have a UK giveaway, and the chance to win a delightful read this Christmas! In response to your question i would have to say that i would love to win this book because i have not as yet read any works by Belinda Jones, and i would really love to and be able to review her books too. It would make my Christmas to not only have something great to read, but also that is connected with the time of year and which will really add to the whole 'Christmas Spirit'. I adore tales set at Christmas such as "The magic of Christmas by Trisha Ashley" and "the night before christmas by scarlett Bailey" and not forgetting "Christmas as Tiffany's by Karen Swan"(which i read quite a long time ago, and loved). It would make this December extra special to read something new and learn more about a most exciting author. The book sounds fab! Definitely on my to-read list for the holidays! I also love christmas books and i'm happy if i could get this one ..